It’s important to make sure that when you’re on the golf course, that your golf swing is the only thing that you have to worry about. It can be easy to overlook how often your battery is charged, and the amount of time that you can go between changes depends on the quality of the golf cart battery that you have. Read on learn everything that you need to know about choosing the best golf cart battery. We have reviewed some of the leading golf cart batteries currently on the market and rated them. Rating is based off a combine review of the features and components listed below. ​There’s a lot to consider when you’re purchasing a golf cart battery. After all, the quality and strength of this battery can make or break your golf weekends. You’ll want to consider things like whether or not you’d like to buy new or used, voltage, the battery type, and a few other factors before you make your purchase. There’s a lot to consider when you’re purchasing a golf cart battery. After all, the quality and strength of this battery can make or break your golf weekends. You’ll want to consider things like whether or not you’d like to buy new or used, voltage, the battery type, and a few other factors before you make your purchase. You’ll want to make sure that you can yield as much energy as possible from your golf cart battery. If you buy a cheap battery that doesn’t allow for much use in between charges, you’ll find yourself regretting it in the long run. You might have to spend more money to replace your golf cart battery if it’s only allowing you to get one game’s worth of use before you have to charge it. .
You’ll want to make sure that you can yield as much energy as possible from your golf cart battery. If you buy a cheap battery that doesn’t allow for much use in between charges, you’ll find yourself regretting it in the long run. You might have to spend more money to replace your battery if it’s only allowing you to get one game’s worth of use out it before you have to charge it. ​Golf cart batteries vary in voltage; They range from 6(6v), 8(8v), and 12(12v) volt batteries. The voltage of your golf cart battery can be a deciding factor in its overall lifespan. For example, if you purchase six 8 volt batteries, it will yield a 36-volt operating system. Additionally, four 12 volt batteries will give you a 48-volt operating system. It's better to be selective of the brand when deciding where ​to purchase your golf cart batteries. Doing so will ensure the effectiveness and quality of the battery you plan on buying. Plus, it will save you money by getting the best golf cart battery your money can afford. Golf cart batteries vary in voltage; They range from 6(6v), 8(8v), and 12(12v) volt batteries. The voltage of your golf cart battery can be a deciding factor in its overall lifespan. For example, if you purchase six eight volt batteries, that will yield a 36-volt operating system. Additionally, four 12 volt batteries will give you a 48-volt operating system. It's better to be selective when deciding where you'd like to purchase your golf cart batteries so that the effectiveness your long-term investment isn't ruined. ​AGM (Absorbed Glass Mat) lead-acid battery. Batteries such as this, are deep cycle batteries that can be used up by 80% on a frequent basis and still operate at a high-quality level. The plates on these batteries are thicker and far more durable than the plates on a cranking or starting batty. AGM (Absorbed Glass Mat) lead-acid battery. Batteries such as this, are deep cycle batteries that can be used up by 80% on a frequent basis and still operate at a high-quality level. The plates on these batteries are thicker and far more durable than the plates on a cranking or starting batty. Flood lead acid battery. These batteries are usually cheapest in terms of up front cost, and, and they’re usually left unsealed so that the owner can replace the water that the electrolytes in the battery have lost during charging. If you don’t replace the water in this battery, it’s highly likely that it won’t last long. Gel lead acid battery. Unlike flooded lead-acid batteries, these batteries are sealed with a silica gel that's added to the electrolyte that prevents the liquid inside from moving around. You cannot use the same battery charger that you would for a flooded lead-acid battery or an Absorbed Glass Mat lead acid battery. You'll need a unique charger for this battery, and you can find examples of a gel lead acid golf cart battery here. Gel lead acid battery. Unlike flooded lead-acid batteries, these batteries are sealed with a silica gel that's added to the electrolyte that prevents the liquid inside from moving around. You cannot use the same charger that you would for a flooded lead-acid battery or an Absorbed Glass Mat lead acid battery. You'll need a unique charger for this battery, and you can find examples of a gel lead acid golf cart battery here. Even if you buy the best golf cart battery on the market, it won’t do you any good if you purchase terminal battery cables that are the wrong size for your battery. This could make or break the longevity of your battery, and you’ll want to be sure that you’re being mindful of how many terminals are in your golf cart battery so that your battery doesn’t overheat. Even if you buy the best golf cart battery on the market, it won’t do you any good if you purchase terminal cables that are the wrong size for your battery. This could make or break the longevity of your battery, and you’ll want to be sure that you’re being mindful of how many terminals are in your golf cart battery so that your battery doesn’t overheat. One of your top priorities is to make sure that your golf cart battery has a long life, as it can be inconvenient and costly to keep replacing them. It’s best to make sure that your new battery isn’t too old, fully charged and fully functional. A good golf cart battery should have been manufactured been made at a maximum of six months from when you bought it. Many manufacturers that make golf cart batteries will place a sticker on the battery that lets you know when it was made. You’ll be able to find this sticker with the manufacturing code on it in the description of the product or on the top right side of the battery. One of your top priorities is to make sure that your golf cart battery has a long life, as it can be inconvenient and costly to keep replacing them. It’s best to make sure that your new battery isn’t too old. A good battery will have been made at a maximum of six months from when you bought it. Many manufacturers that make golf cart batteries will place a sticker on the battery that lets you know when it was made. You’ll be able to find this sticker with the manufacturing code on it in the description of the product or on the top right side of the battery. ​You should decide whether or not you'd like a used or brand new golf cart battery. In the last section, we discussed how the freshness of your battery can impact how long it lasts. You'll have to evaluate whether you'd like to pay less upfront, and potentially spend money on another battery later or if you'd like to invest in a fairly new battery that could last you a few years. Related post: Should you buy a new or used golf cart? You should decide whether or not you'd like a used or brand new golf cart battery. In the last section, we discussed how the freshness of your battery can impact how long it lasts. You'll have to evaluate whether you'd like to pay less upfront, and potentially spend money on another battery later or if you'd like to invest in a fairly new battery that could last you a few years. ​Although you’ll definitely want to consider the basics listed above when purchasing a golf cart battery, you’ll want to consider some premium features when you start shopping. You might consider shelling out the extra cash when you factor in the value of a warranty, maintenance free battery, or the vibration resistance of your battery. Although you’ll definitely want to consider the basics listed above when purchasing a golf cart battery, you’ll want to consider some premium features when you start shopping. You might consider shelling out the extra cash when you factor in the value of a warranty, maintenance free battery, or the vibration resistance of your battery. ​It might be worth it to spend some extra money on a deep cycling battery. Deep cycling batteries are designed to be frequently exhausted to their capacity. Unlike other batteries, their long-term use won't be affected by constant depletion and charging. ​Inspecting your battery for leaks, terminal corrosion, and loose wire connections. Inspecting your battery for leaks, terminal corrosion, and loose wire connections. Having to water your batteries and inspect the electrolyte level of them. You’ll also be able to cut down on how much time you spend maintaining your battery if you follow the following tips. ​Store your batteries in a cool, dry place. If your battery is in an area that is even ten degrees over room temperature, you could notice a 50% decrease in battery life. ​If you’re going to be keeping your batteries stored for a long stretch of time, be sure to fully charge your battery every three to six months. Check your battery at least once a month so that you have an idea of how often the water in your wet cell or flooded batteries need to be watered. If you purchase a golf cart battery with an extended battery life in comparison to other models, you’ll find yourself reaping the benefits in the form of going at least eight hours without having to be recharged. When you’ve invested in a high quality, long lasting battery, it could last you at least five years. If you've purchased have a high-quality golf cart battery, it should be designed using high-density components as well as built-in electrical short protection that protects parts that generate power from shorting out. These components will allow you to travel over more bumpy terrain and leave your golf cart to charge without needing to worry about power surges. Similar to rugged construction, a high-quality battery will oftentimes include vibration resistant components. These anti-shock parts give the battery another layer of protection against the bumpy hazards of golf courses. In addition to considering the vibration resistance and extended battery life of your golf cart battery, a battery that’s been designed to evenly and efficiently distribute power is key. Getting power from A to B quickly is a no-brainer when it comes to high-quality batteries, but doing so efficiently means supplying high levels of power while minimizing wasted power. If your pricey battery is not fulfilling its purpose and dies in the middle of a game, it's good to have a backup plan like a good warranty. Most batteries come with a manufacturer warranty, but some high-tier batteries come with warranties in case an environmental failure. Shorting, corrosion, you name it. When investing in a costly battery, protection in case of disaster is a must. We will be using three basic measurements with a rating scale of 1 star to 5 stars with 5 stars being top of the line. These comprehensive ratings can be found at the bottom of this page in our ﻿﻿﻿﻿s﻿﻿﻿﻿ortable chart﻿﻿﻿﻿﻿﻿. What brands are the best golf cart battery to buy? Let’s look at the list at 5 of the best electric golf cart batteries in the market today. ​Before you begin your search for the perfect golf cart battery, it’s best to bookmark some of the best golf cart batteries that are already on the market. You can find the pros and cons of some of the most popular brands listed below. Before you begin your search for the perfect golf cart battery, it’s best to bookmark some of the best golf cart batteries that are already on the market. You can find the pros and cons of some of the most popular brands listed below. The Universal Power Group’s 12 Volt UB12350 batteries are made under the strictest quality control standards. These batteries are held to the non-spillable standard set by the DOT (Department of Transportation), ICAO (International Commercial Airline Organization), and the IATA (International Airline Transportation Association). A monocrystalline 100-watt panel, a decent charge controller and a microprocessor controlled charger are included to charge this battery through solar power. ​This battery is very affordable. You can purchase a two pack of these from an online retailer like Amazon. This battery is very affordable. You can purchase a two pack of these from an online retailer like Amazon. ​These 12v batteries are long lasting. These 12v batteries are long lasting. They offer an easy, no fuss installation. ​The absence of a free-flowing electrolyte helps makes this battery leak resistant. The absence of a free-flowing electrolyte helps makes this battery leak resistant. ​The price tag. Given that this is a high-quality battery, it's going to run on the pricier side. The price tag. Given that this is a high-quality battery, it's going to run on the pricier side. You’ll have to wait for it to be delivered in order to get a good deal, or a brick and mortar store will charge you almost twice the amount that you can get this battery for online. Trojan's T-105 8 Volt battery undergoes almost 200 points of inspections before it's distributed to various retailers. With plates that boasts are boasted to be 30% thicker than the plates that are installed in competing batteries, these batteries are designed to be extremely durable and long-lasting. It is a wet lead-acid battery which is excellent for long-term usage. It also works well with a variety of battery chargers and is less sensitive to the risks of overcharging as compared to other AGM batteries. The T-875 uses top of the line and very innovative technology to ensure the battery will last for years and suit a variety of needs. The T-875s design provides a slow discharge; has built-in vents; ensures low maintenance; has high profile terminals; and has a range of amperage outputs. Trojan's T-105 battery undergoes almost 200 points of inspections before it's distributed to various retailers. With plates that are boasted to be 30% thicker than the plates that are installed in competing batteries, these batteries are designed to be extremely durable and long-lasting. 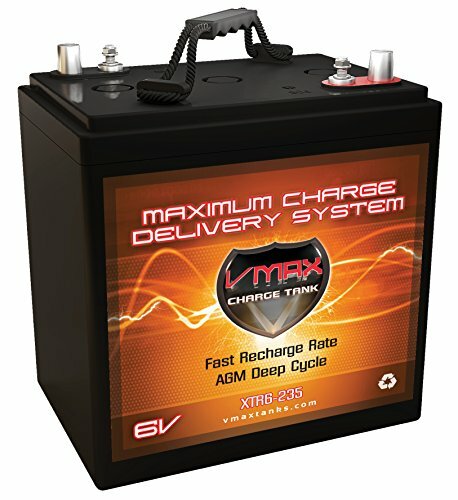 ​This is a long-lasting battery, that can allow up to 50 miles of driving in a golf cart if cared for properly. This is a long-lasting battery, that can allow up to 50 miles of driving in a golf cart if cared for properly. ​You can get a discount on these batteries by visiting a local dealer. You can get a discount on these batteries by visiting a local dealer. Depending on which retailer that you purchase your Trojan T-105 from, you can get a 36-month warranty on your battery. ​This is a flooded lead-acid battery and will require maintenance like watering the battery. This is a flooded lead-acid battery and will require maintenance like watering the battery. ​You have to be careful not to undercharge this battery, or it won't live up to the long lifespan that Trojan boasts. You have to be careful not to undercharge this battery, or it won't live up to the long lifespan that Trojan boasts. The UPG U1 is a 12v sealed lead acid battery that runs cheaper than many of the best batteries on the market. It is very lightweight and only weighs 22 pounds. These batteries have an outstanding life cycle longevity and are easy to install. The UPG UB12350 is an AGM battery which also makes them suitable for for solar-powered charging. A monocrystalline 100-watt panel, a charge controller and a microprocessor-controlled charger will charge this `12V battery in no time. The UPG U1 is a 12v sealed lead acid battery that runs cheaper than many of the best batteries on the market. It is very lightweight and only weighs 22 pounds. ​Can be purchased for under $100. Can be purchased for under $100. ​Long lasting battery and it’s built to be spill proof to save you any trouble. Long lasting battery and it’s built to be spill proof to save you any trouble. ​The UPG U1 has great vibration resistance. The UPG U1 has great vibration resistance. ​These batteries can be purchased in a value pack that will include two batteries for a discount price. These batteries can be purchased in a value pack that will include two batteries for a discount price. ​Compared to other high-end batteries, the UPG U1 might not power your golf cart as well in between games. Compared to other high-end batteries, the UPG U1 might not power your golf cart as well in between games. ​Due to the battery being manufactured with the intent to be used with smaller pieces of machinery, you may have to buy more one than one battery depending on the size of your golf cart. Due to the battery being manufactured with the intent to be used with smaller pieces of machinery, you may have to buy more one than one battery depending on the size of your golf cart. ​Exide's E-3600 golf cart battery is an especially good investment because it is the best option for the golfer that prefers to spend more time on the course and less time maintaining their golf cart battery. The absence of a liquid inside of these batteries makes for a hassle-free installation and replacement. Exide’s golf cart battery is also good for the environment as it’s said to have less than 4% gas emission. It’s a reliable, and rugged battery that’s been equipped with thick plates that allow the battery to last for years despite frequent use. Exide's E-3600 golf cart battery is an especially good investment because it is the best option for the golfer that prefers to spend more time on the course and less time maintaining their golf cart battery. The absence of a liquid inside of these batteries makes for a hassle-free installation and replacement. ​An extremely durable battery, it has excellent vibration resistance. An extremely durable battery, it has excellent vibration resistance. ​Lightweight; The Exide E-3600 battery only weighs 62 pounds. Lightweight; The Exide E-3600 battery only weighs 62 pounds. ​Has twist and release vent caps for easy maintenance. Has twist and release vent caps for easy maintenance. ​The Exide E-3600 has a low life cycle of 600 cycles. The Exide E-3600 has a low life cycle of 600 cycles. ​It requires more charges in between rides in comparison to other golf cart batteries. It requires more charges in between rides in comparison to other golf cart batteries. ​The Deka Promaster GC15 is a heavy duty, high-end battery that allows the battery owner to go without performing maintenance duties for large amounts of time. It's equipped with premium glass mats that protect the battery's ability to keep energy stored. It has a weather resistant polypropylene case that's designed to endure long-term wear and tear. The Deka Promaster GC15 is a heavy duty, high-end battery that allows the battery owner to go without performing maintenance duties for large amounts of time. It's equipped with premium glass mats that protect the battery's ability to keep energy stored. It has a weather resistant polypropylene case that's designed to endure long-term wear and tear. ​This battery is equipped with high-density plates that allow for deep cycling. This battery is equipped with high-density plates that allow for deep cycling. ​It has a rugged, vibration resistant construction that can tolerate heavy use. It has a rugged, vibration resistant construction that can tolerate heavy use. ​The Deka Promaster GC15 promises a leak-free battery. The Deka Promaster GC15 promises a leak-free battery. ​This is not a maintenance-free battery, you'll need to water it. This is not a maintenance-free battery, you'll need to water it. ​Depending on which vendor that you get this battery from, it’s pricier than other batteries like the Trojan T-105. Depending on which vendor that you get this battery from, it’s pricier than other batteries like the Trojan T-105. Buying a golf cart battery can be a complex process. It's important to be armed with knowledge about what you'll need in terms of affordability, battery brands, long-term maintenance and the longevity of the battery. If your battery is the last thing that you need to worry about, you’ll be free to focus on that golf swing. Tying it All Together - Which Golf Cart Battery Is Best For You? Golf Cart for Sale! Should I Buy New or Used?